It's a family tradition of ours to decorate for Christmas the weekend after Thanksgiving. Our son's birthday falls during Thanksgiving week, so we try to separate the holidays as much as we can and save Christmas festivities for after Thanksgiving so that his birthday will be just as special as everyone else's. So this past weekend, we bought our tree and got ready to decorate, only to realize that all of our Christmas decorations, except for this mini tree I've had for years and a few small items, were still in our storage unit back where we used to live. Oops! If you've been hanging around here lately, you know this seems to be the trend of how things go for us these days! Moving a long distance with two kids under the age of two is no easy task. We are still not totally unpacked months later, and we still have a lot of belongings in a storage unit. There have been plenty of instances of "where is the bin of six month size baby clothes?" and "where are all of my fake pumpkins?" that leave us wondering why we ever thought we would be able to quickly go back to empty the storage unit after we moved! The process of getting our house in order and starting to make it feel like home has been slow and steady with two little ones to wrangle. So, when Jenn and Vicki from 2 Bees in a Pod asked me if I wanted to join their Come Home for Christmas holiday room tour, I jumped at the opportunity because it was the little push I needed to make a space in our home feel more like "us" and to get ready for the holidays. But truth be told, I had been feeling a little down lately because my grandmother passed away last week the day after Thanksgiving, so when we discovered all of our Christmas decorations were missing, I almost backed out of this room tour., which is so unlike me to even let that thought cross my mind! It was just the icing on the cake! 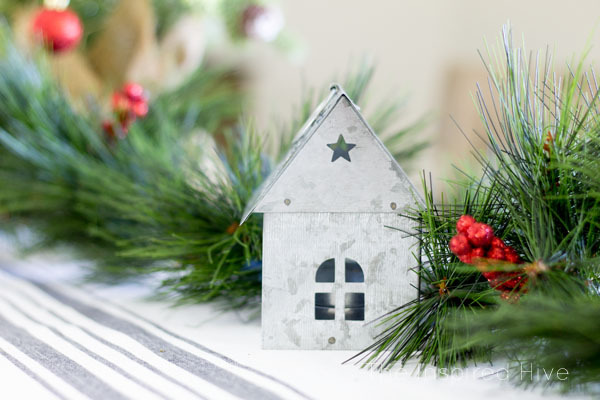 But then, I thought about how much joy Christmas decorating brings me and how peaceful it feels to walk through a room that is holding the Christmas spirit. And creativity is always so so good for my soul, so I knew it would truly be healing to still participate. So, I looked at this one little tree I had and brainstormed how I could make it work. It was a totally different vibe from the decor I was envisioning in my head, but instead of starting from scratch, I let this little tree guide the room. I actually received this tree as a gift from my best friend in high school. We were crafty kids and always made each other gifts and decorative notes. Back then, this tree was decked out in pink glittery ornaments and girly sentiments. As I got older, at first I didn't want to change the tree decorations, holding on to that glimmer of childhood through pink sparkles. Eventually, I realized it was better to let the tree evolve with my style to be enjoyed each year rather than just keeping it in storage as a distant memory. So now, all that remains from the original tree are the white flowers and the lights. 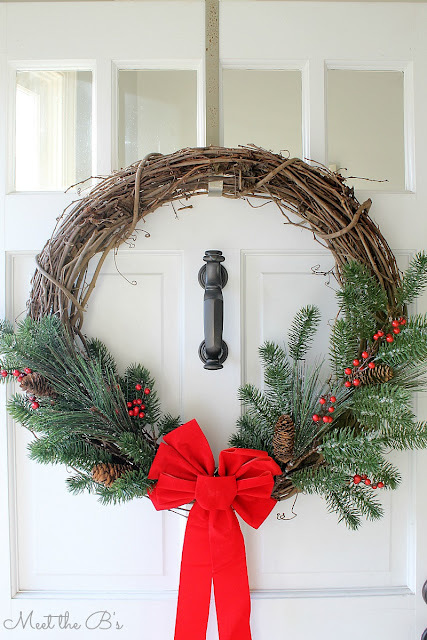 This year, I added the pinecone ornaments to incorporate a touch of rustic decor and swapped out the bow. 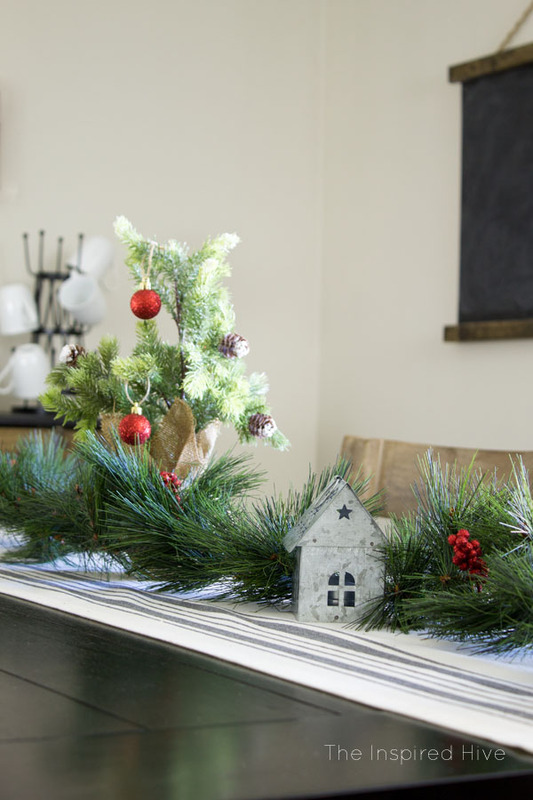 Inspired by the tree's "new" look, I hauled the whole family to the craft store for some Christmas decor shopping to makeover our dining room. The tree is sitting on the credenza in our dining room. It's a little tough to photograph the whole credenza, but on the other end, I put a red and white candle in one of my wooden lanterns and some bottle brush trees to add a little greenery. When I am decorating for holidays, I try to incorporate as much of my "usual" stuff as possible instead of completely redoing everything. 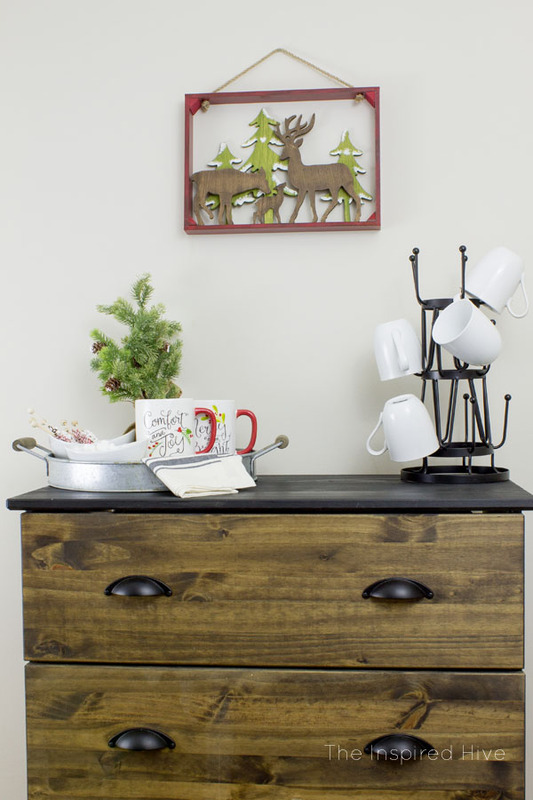 You can see that I used our everyday table runner, coffee bar accessories, and chalkboard. I just added a touch of red, green, natural elements, and galvanized metal accents so that it would blend seamlessly with the wood, black, and galvanized metal that is normally in this room. 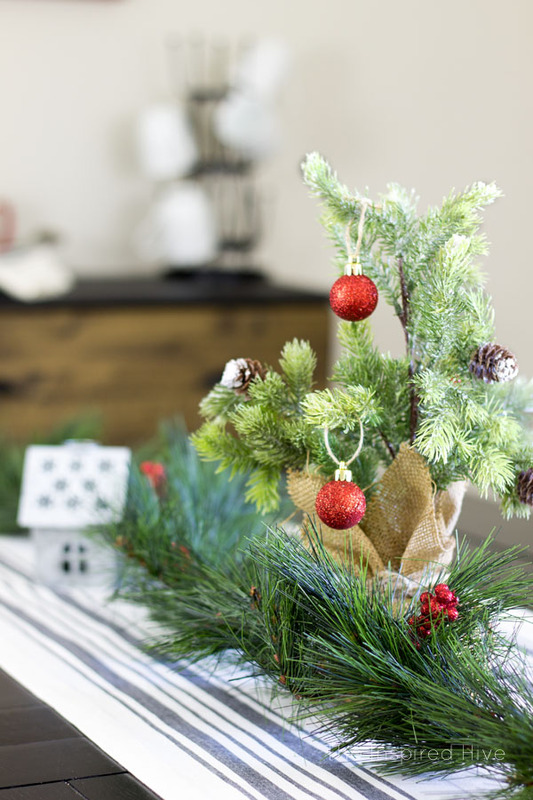 Inspired by the mini tree I started with, I chose a small tree with a burlap bottom as a centerpiece. 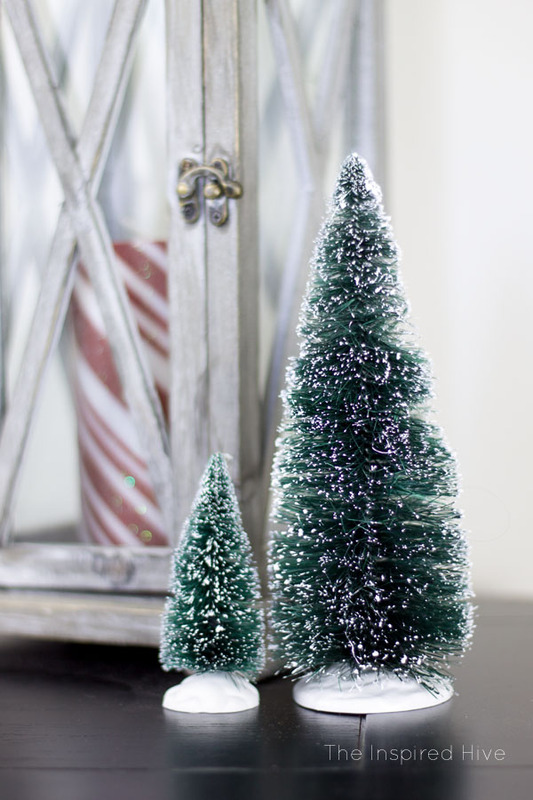 I found a cheap pine garland at Walmart and these cute little galvanized metal houses for tea lights at Home Goods. I wove the garland in and out of my "base" decorations. 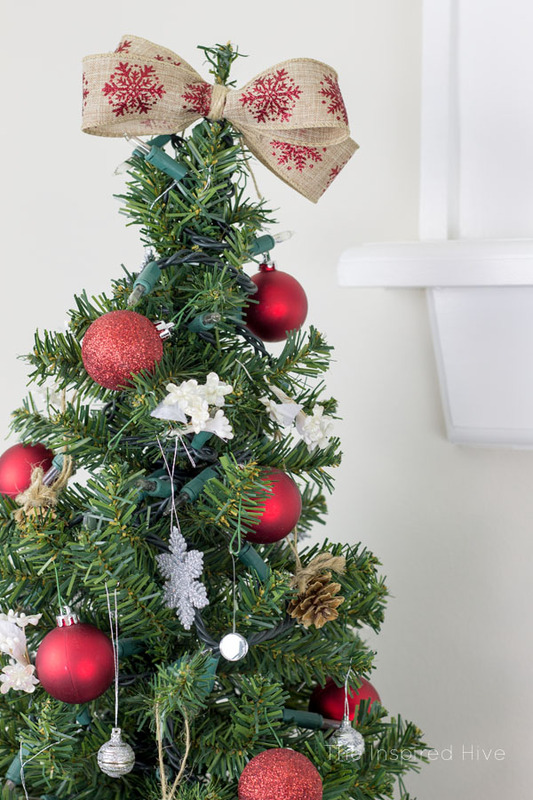 To add the pop of glittery red that my inspiration tree had, I hung some red ornaments from the tree and tucked some glittery red berries into the garland. For the first time ever, I erased the encouraging words on my DIY chalkboard and updated it for Christmas. I usually use a chalk marker and this easy way to transfer fonts when writing on chalkboards, but I was pressed for time and decided to freehand it with real chalk. I have a lot of room for improvement, but I am impressed with how far my handlettering has come! I do not have the neatest handwriting normally! I also added a set of galvanized metal Christmas bells to complete the look. I shifted things around on our industrial shelving and added a little bit of greenery and red glittery accents. 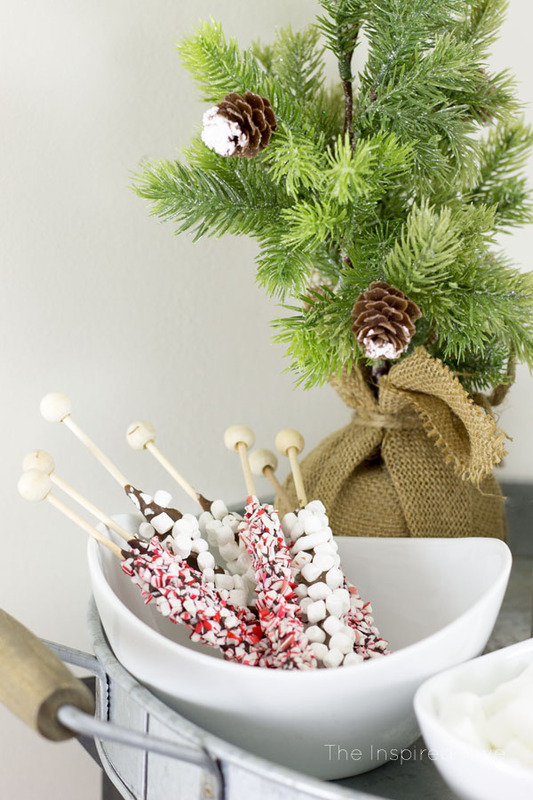 It's amazing how a few small touches of Christmas colors can make a whole room feel cheery! Normally our coffee supplies sit in this galvanized tray. 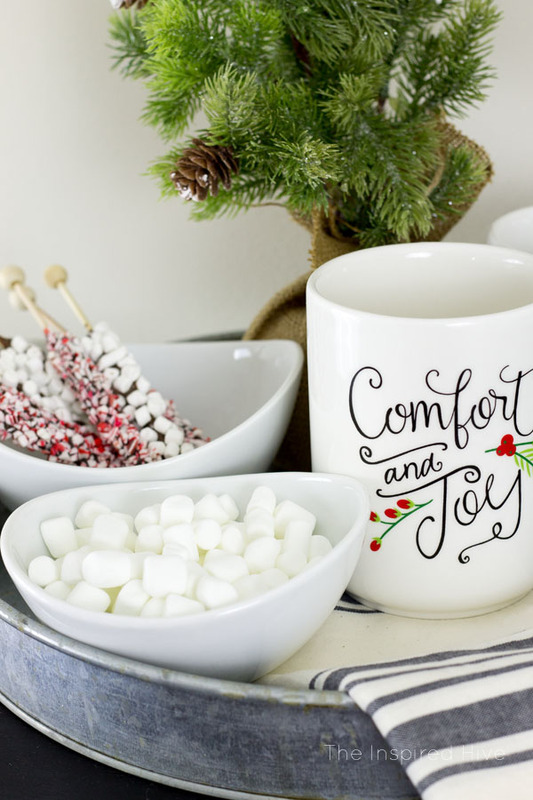 I swapped them out for these adorable holiday mugs and bowls of marshmallows and stirring sticks. 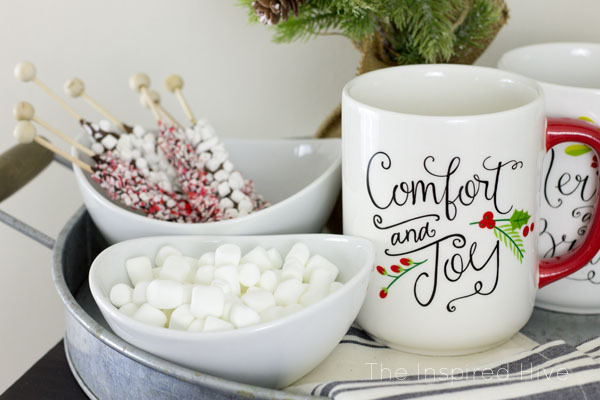 All ready for a warm cup of hot chocolate! I'm so thankful to have this cheerful holiday room until we can get the rest of our Christmas decor out of the storage unit. The dining room is the heart of our home, and it fills me with joy to see it all decked out each time I walk through it. And although it isn't exactly what I had planned out in my head, I love that the whole space was inspired by that little tree from my childhood. 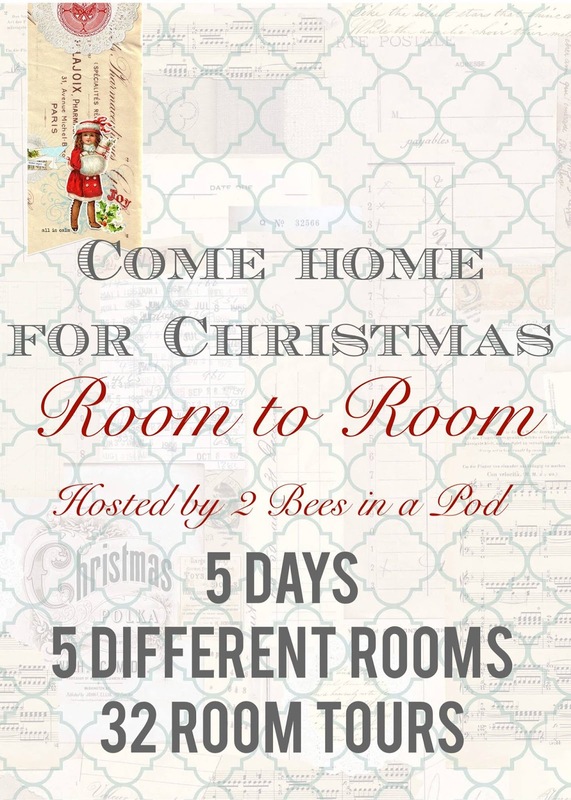 I would love for you to visit the rest of the holiday room tours on my friends' blogs! Today is all about dining rooms and the rest of the schedule is listed below. I can't wait for you to see all of their beautiful spaces! 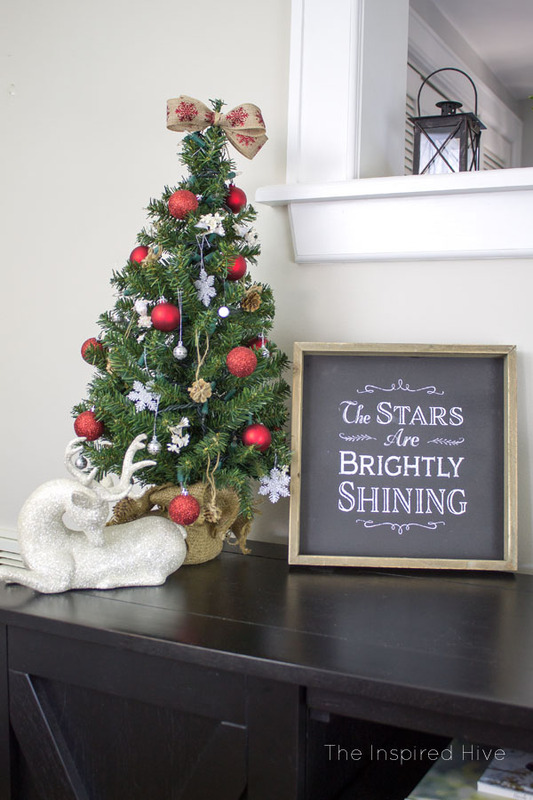 So much inspiration as we get ready to decorate for Christmas! Nicole, it's so pretty! 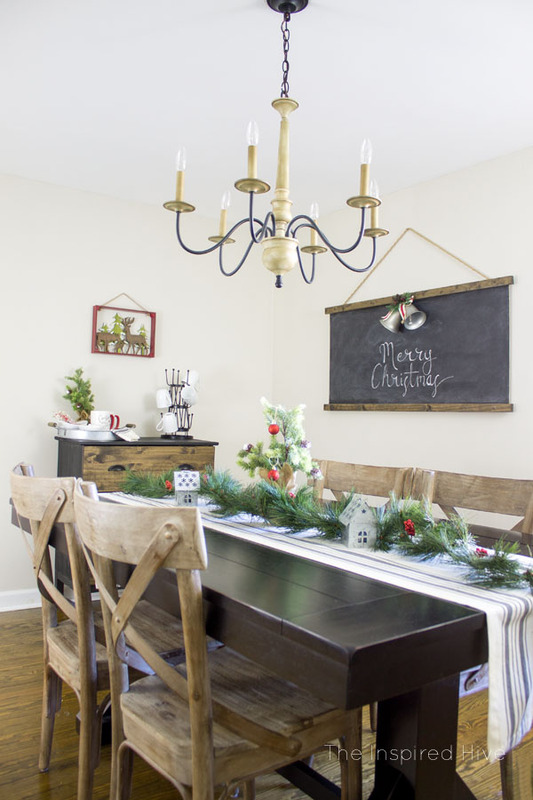 I'm in love with your DIY chalkboard, and those bistro chairs look amazing and make the room look so warm and inviting! This is all so lovely Nicole! Thank you for your kind words, Lydia! Your dining room is beautiful!!! I'm so sorry about your grandmother. 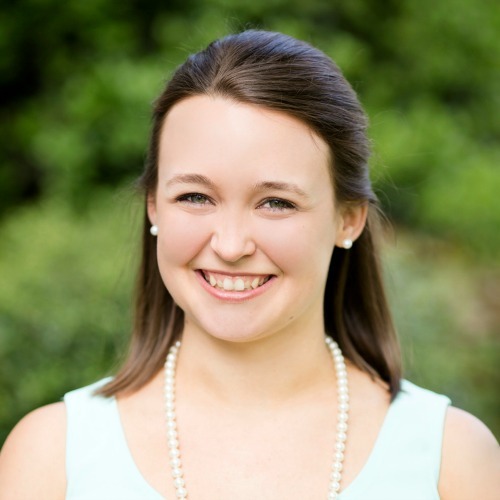 Your dining room is gorgeous - I just love your chairs and all of the festive touches! I'm sorry about your grandmother. It's hard to lose family during the holidays. She would be proud of you continuing on. Your dining room us fabulous! Nicole I don't know how you pulled this beautiful room together with everything you have going on! It's really lovely and must be one of your favorite rooms in your new home! Thank you so much, Bre! I don't know how we managed either, but I'm loving it! 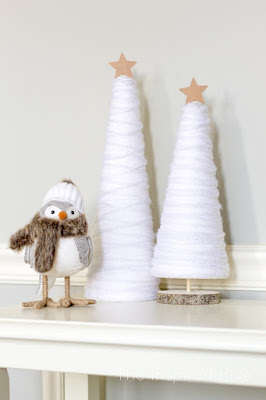 I totally agree with you on using what you already have to decorate - that's how I do it around here too! Although I didn't need to go through the struggle of finding boxes from a move - I can't imagine how hard that must be. I love your dining room, especially the galvanized metal accents! Your Christmas Dining Room looks so pretty Nicole! 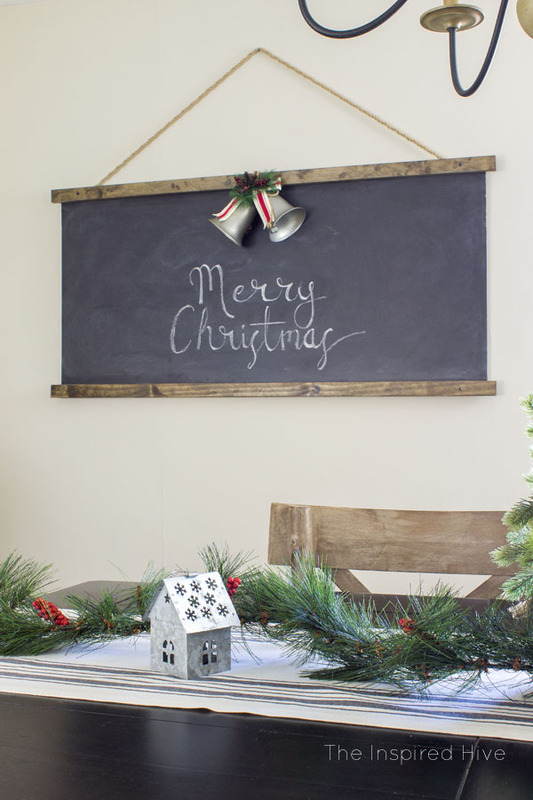 Love the DIY chalkboard you made with the Merry Christmas sign! Thanks, Tara! The chalkboard is one of my favorite DIYs! This is so beautiful! I love how you used the garland as a table runner! Thank you! I love finding different ways to use garland! Everything looks so cozy and welcoming! LOVE that coco bar! Your room looks so pretty and you are doing great for moving with two little ones. I am sorry to hear about your grandmother. It is beautiful to hear you see Christmas as a time of healing though. Thanks, Rachel! That means a lot! I'm so sorry to hear about your grandmother's passing. Losing someone is difficult but it's especially hard during the holidays. 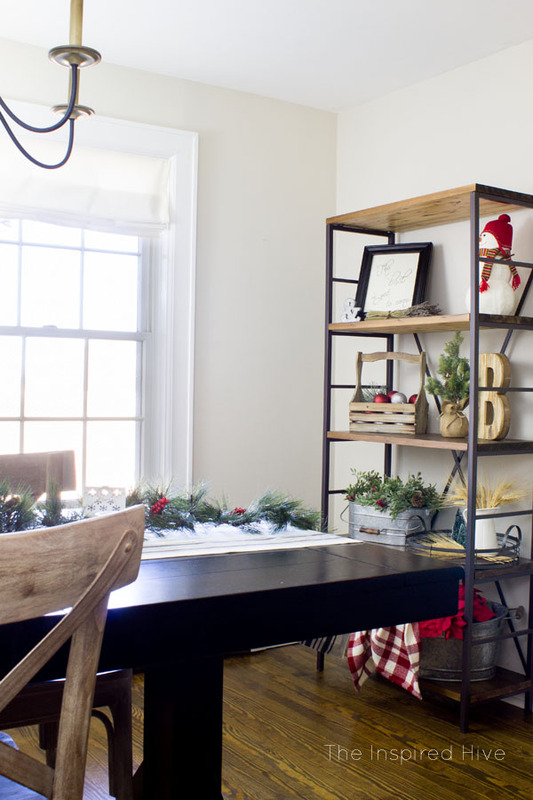 Love your pretty dining room and all the Christmas touches you added. I especially love the little houses. I have the same ones. Happy Holidays! I love your style and you are crushing it with those little metal houses. I must get some! Happy Holidays! Thank you, Kristy!! Aren't they so cute?? I need to find more! I think you've done a beautiful job in your dining room! I love your chalkboard (your handwriting is so pretty) and those sweet little galvanized houses are the perfect touch in your table decor!